Koror has a range of modern shopping facilities on offer. Several small gift shops offer a variety of traditional souvenirs and t-shirts as well as some more unusual items, and the Belau National Museum and Ormuul Gift Shop offer authentic handmade local craft items. Palau's best-known art form is the storyboard. These are carvings on various lengths of wood, sometimes shaped into crocodiles, turtles or fish and painted. The storyboards depict Palauan stories taken from about 30 popular legends or recorded events. In addition to the storyboards, models of bais (men's meeting buses), canoes and sculptured figurines called dilukai are also carved. Other gifts include jewellery, etchings and baskets, purses, hats and mats woven from pandana leaves and palm. In addition to these local crafts, the Palau Pacific Resort has a duty-free shop, which features locally produced items as well as designer and brand name gifts. The WCTC Shopping Centre and, to a lesser degree, the Suangeur Shopping Centre have a range of modern shops including pharmacies stocked with international brands, clothes shops, souvenirs, furniture and toy shops amongst others. These are the main shopping zones for everyday necessities, although prices are significantly higher than in the United States and Europe for many international products. All dive centres sell a wide range of diving equipment and accessories of major brands. Be aware that many endangered or protected shark or marine life products are illegal in Palau so in the highly unlikely event that you are offered these be sure not to purchase them. If in doubt ask at the tourist information office. 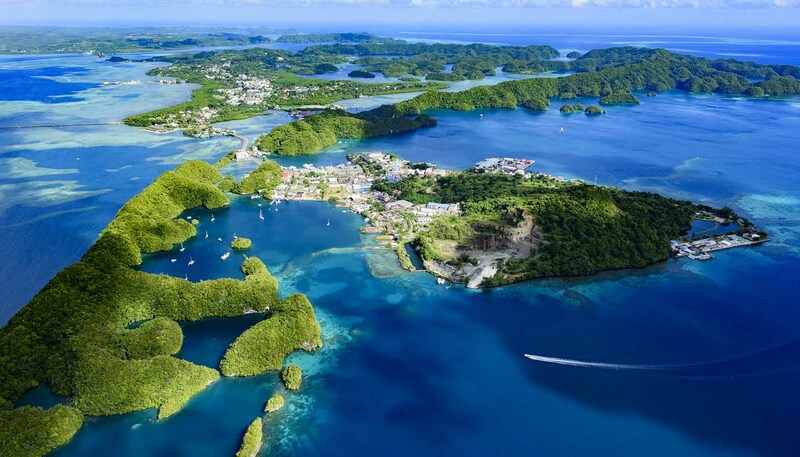 One bottle of liquor and one pack of cigarettes can be brought into Palau duty-free. As a premier diving destination Palau's visitors tend to go to bed early and rise early, meaning it isn't known for its bounding nightlife. Having said that there are still a good few places to unwind and enjoy a few of the local Red Rooster beers. The dive shops have small, rustic bars which tend to have a relaxed fun atmosphere for après diving and for watching the spectacular sunsets. There are lots of lively restaurants in Koror serving a variety of international food, but for bars, Malakal has the lion's share of nightlife venues (most of which offer food too). Some of the most popular venues with foreign visitors are the restaurants with bars which have a tropical, lively atmosphere. From open air cocktail lounges, some of which have live entertainment or karaoke, to Happy Hour beers, pool halls and the more swish bars found in the hotel resorts, there is a good selection of relaxed venues where you can let your hair down. For dancing, head to the Port area of Malakal, where there are some cha-cha clubs popular with young Palauans. Most places stay open until 0200 but if it's quiet they will close early.